Small gold spheres, with diameters ranging roughly between 2 and 100 nm, draw much attention from scientists. Not suffering from photobleaching, they can be appealing labels in biophysical experiments. Besides being interesting as labels, the physical properties of the particles as they interact with light are also highly intriguing. This project aims at developing new techniques to detect single gold nanoparticles and to study their photophysical properties on a single-particle basis, using short laser pulses as an excitation source. We developed a novel method for pump-probe spectroscopy on single gold nanoparticles, based on a common-path interferometer (see Figure 1). In short, we use a birefringent calcite crystal to separate a short laser pulse in two pulses, a probe pulse and a reference pulse (the green beam path in Figure 1). The pulses are not separated is space, as is the case for example in a Michelson interferometer, but in time; the probe pulse is delayed by 10 ps with respect to the reference. The pulses are sent through a microscope in which a sample containing gold nanoparticles is mounted. Behind the microscope a second crystal overlaps the two pulses again, which causes them to interfere. Figure 1. Simplified drawing of the setup. We will only measure a signal if we make sure that the optical response of the particles changes in the 10 ps interval between the probe and the reference pulse. This change in response is achieved by exciting the gold nanoparticles with a pulse from a second laser source: the pump pulse (see the red beam path in Figure 1). Excitation of a gold nanoparticle with a short laser pulse first heats the electron gas. This process is fast, the electrons cool in about 1 ps and causes a short but strong spike in the optical response (see Figure 2). While the electrons cool, they heat the particles’ lattice. This will cause thermal expansion, but since the heating of the lattice is very sudden, the nuclei in the lattice ‘overshoot’ their new equilibrium position and a mechanical oscillation is launched (see Figure 2). Our project focuses on the detection of these acoustical vibrations in single gold nanoparticles. Freed from inhomogeneous broadening, which often dominates the damping of the vibration in ensembles, we can directly access the intrinsic damping of the individual particles. Since this damping depends strongly on the environment, this experiment opens a window to employing single gold particles as nanosensors. Figure 2. 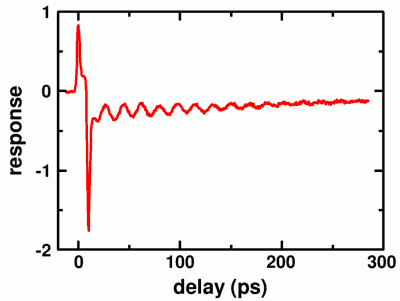 Example of the optical response of a single 50 nm gold particle to excitation with a pump pulse. The two sharp peaks are caused by the excitation of the electrons, while the damped oscillation stems from the acoustical vibrations of the particle.